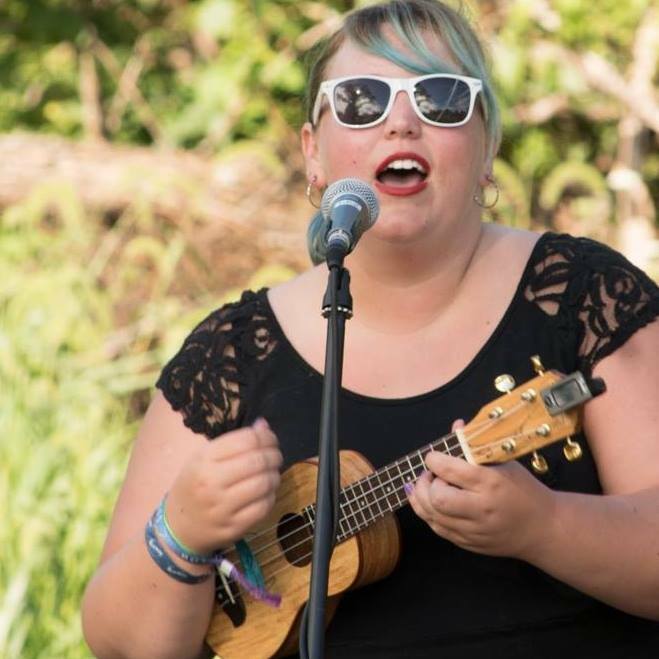 Nicknamed the “band to melt all faces” by some people on the Internet, Britches & Hose Ukulele Club is an eight-piece all-ukulele-all-the-time ensemble from central Iowa. Using a combination of ukuleles, voices, and rock-star charisma, Britches & Hose delivers a new twist on popular songs. Song selection ranges from folk to pop to arena rock – you’re never quite sure what B&H will play next. To learn more, find Britches & Hose on Facebook. Amber came to Britches & Hose with a background in piano/organ and with a smooth alto voice that helps give the group its signature harmonies. Outside of ukulele, Amber enjoys quilling elaborate portraits of her two cats. You might recognize Billy from his many other musical adventures including jam band Floodplane, bluegrass group Crossroads, and general fiddling around Central Iowa. His impressive rock solos on ukulele are one of the primary reasons to catch a Britches & Hose show. In his spare time, you can find him trying new sour beers and baking sour breads. Always creating, Bridget is the mastermind behind the holy Britches & Hose logo. Her infectious smile and sweet dance moves keep the band's live shows on fleek. When not playing the solo in Sweet Child O' Mine, Bridget is knitting dog sweaters and practicing the splits. Bruce's baritone voice and baritone ukulele help round out the bright pinging of an all-ukulele group. An outdoor enthusiast, Bruce builds the perfect firewood pyramid and has a laugh that echoes off the mountains (in the best way). Even if he wasn't an exceptional musician, Britches & Hose would have recruited Greg for his glorious hair -- both head and facial. If you've ever been to a live show in Central Iowa, there's a good chance Greg was in that band. Without John, Britches & Hose would still be playing in the minor leagues. His bass ukulele skills help the ukulele club sound like a real band. John also slaps the bass in bluegrass group Crossroads and various ensembles around Central Iowa. Wanna hear a train song? John probably knows it. Britches & Hose resident ginger, Matt Dragon brings the punk to the playlist. Once a drummer always a drummer, watch for Matt Dragon's creative percussion moves on the uke. When not breathing fire, the dragon is constructing elaborate meals and keeping Thumbs in business. A recovering karaoke DJ, Wendy uses ukulele as an excuse to sing in public. She takes over the high notes nobody else wants to sing. Don't recognize her? It's probably because her hair color has changed. Life skills include lipstick application and managing the Britches & Hose Facebook page.